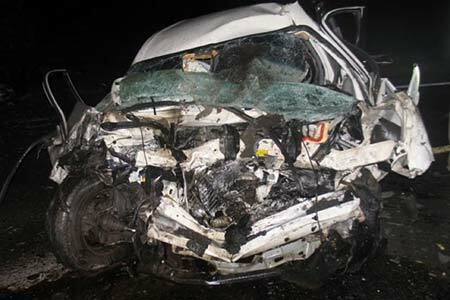 Florence, Arizona—A head-on collision claimed the lives of eight people on SR-79 just south of Florence on Wednesday night. Arizona Department of Public Safety accident investigators report that a southbound Buick crossed the center line into the path of a northbound Chevy Suburban carrying nine people. The driver and front seat passenger in the Buick both died. They have been identified as Angel Mesa, age 41, and Nicole Vidal, age, 33, both from Eloy. The driver and front seat passenger of the Suburban have been identified as Rodney Palimo, age 45, and Kathleen Palimo, age 43, both from Sells, Arizona. Four others in the Suburban were killed. The three remaining occupants of the Suburban were transported to a hospital with serious to life-threatening injuries. Accident investigators have not released the names of any of the victims. SR-79 was closed in both directions for several hours. The investigation is ongoing. We extend our condolences to the families and friends of those who died in this horrific accident, and we wish swift and full recoveries to those who were injured.